Welcome back to another Sleepopolis mattress battle! This time, we’ve got the original Tuft & Needle going up against the newer contender GhostBed. Will GhostBed be victorious and overthrow Tuft & Needle or will Tuft & Needle retain its crown? Keep reading below to see for yourself! Can’t take the suspense? Click here to get straight to the review summary. Unfortunately, Tuft & Needle does not provide any coupons for Sleepopolis readers. 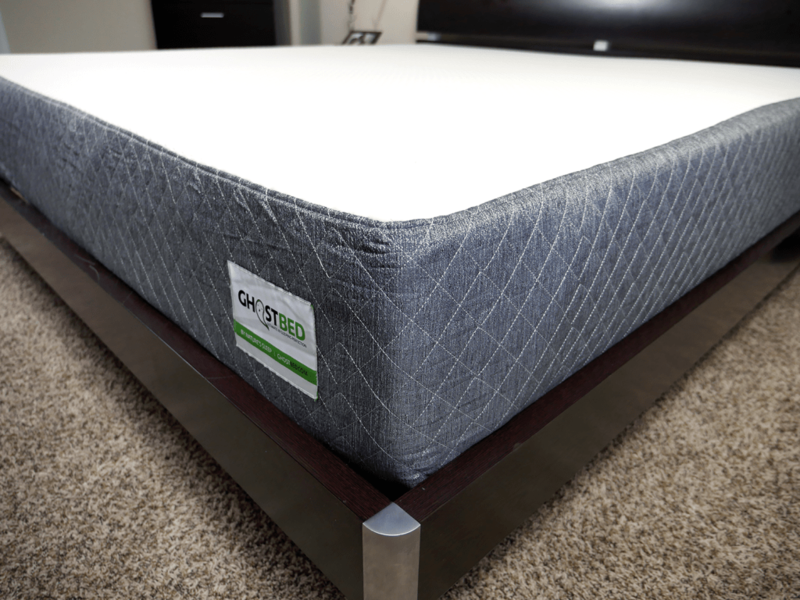 The GhostBed mattress contains three layers, which brings its total height to 11”. That breaks down to 3.5” of comfort foam with a 7.5” support foam base. Top layer (cooling & comfort) – 1.5″ layer of aerated latex foam. The top layer of aerated latex helps to provide cooling, bounce, and comfort to the mattress. This layer also relieves pressure points, and the use of latex means a quicker response time for the sleeper. Middle layer (comfort & support) – 2″ layer of gel memory foam. This layer is placed below the top layer to provide core support, pressure relief, and deep compression support. Naturally less responsive than latex, gel memory foam also works to prevent heat retention. Bottom layer (support & foundation) – 7.5″ layer of high-density support foam. The bottom layer of the GhostBed mattress provides the foundational support for the whole mattress. The top cover of the GhostBed mattress is 100% polyester, making it stretchy and resilient. This added stretch provides a snug fit around the whole mattress, regardless of any tugging or pulling that it might endure. The side panels are a polyester (51%) and polypropylene (49%) blend. The combination of these materials helps protect the mattress with a sturdy and durable side. In addition, the cover has a zipper on the bottom side for easy spot cleaning. Overall, the GhostBed cover is pretty nice. It is very simple, but gives the mattress a modern look free of expensive stitching patterns or excessive detailing. 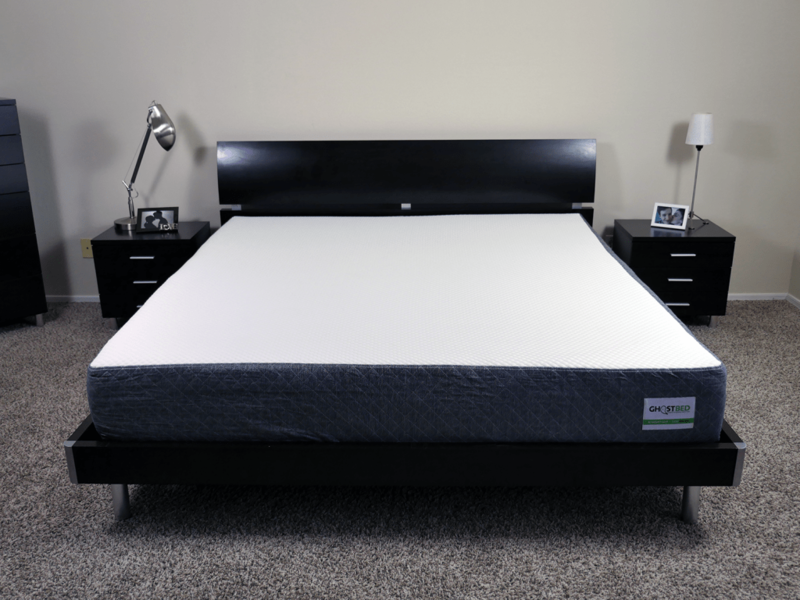 The GhostBed mattress falls around a 6.5 out of 10 on the firmness scale, with 10 being the most firm. Similar to Tuft & Needle, GhostBed seeks to be a “universal mattress” that can meet the needs of almost any sleeper. One thing that is unique about GhostBed is that its firmness tends to change the longer you lay on it. When you first meet the mattress, it feels a bit more like a 7 out of 10 on the firmness scale, but after a few minutes I noticed increasing softness taking it to about a 6.5 out of 10. The latex and memory foam work together to create a comfortable feel, initially being very responsive (from the latex) and developing a deeper contour and hug (from the memory foam) as you settle. For many mattresses, it is either one or the other—the quick response and bounce of latex or the slow response and hug of memory foam. Pros and cons could be argued for both, but in the case of GhostBed, the company does a nice job of finding the balance between the two materials. In regards to cooling, GhostBed does a pretty good job of what it set out to do, and that is to prevent heat retention and improve airflow. The combination of the 1.5” layer of aerated latex foam atop the 2” layer of gel memory foam worked well together to resist heat retention between the layers as well as keeping air flowing through. Lastly, let’s touch on edge support. Overall, it is well done. There is a strong amount of push-back on the edges, which is facilitated by the thicker foam layers and slightly firmer feel. Next up, let’s discuss sinkage. I saw minimal sinkage when lying on my back or side (less that 2”) and slightly more when (conservatively) sitting on the edge. The most amount of sinkage occurred when sitting directly on the edge of the mattress (3-3.5”) or when standing in the middle of the mattress (4-4.5”). As a note, these numbers are reflective of sinkage results after several seconds. Because of the initial firmness from the dense memory foam, you may notice less sinkage initially until it has a chance to adjust. The Tuft & Needle mattress is built from two foam layers equaling a 10″ total height. Top layer (comfort) – 3″ of poly foam. The top layer of the Tuft & Needle mattress is the comfort layer, which is designed to provide comfort and cooling for the mattress. Bottom layer (support + foundational) – 7″ of poly foam. The bottom layer works as the foundational support base, which not only provides support for the above layer, but also deep compression support. The cover for the Tuft & Needle mattress comes with a simple all-white color scheme and the Tuft & Needle logo embossed across the mattress at a diagonal. With a thin design, this cover is able to breathe easily as well as allow the foams to breathe through the cover. The thinness of the cover is a pro for breathability, but possibly a con for durability. I could easily see this cover getting a snag or tear; even brand new, you can visibly see the foam layers through the cover. That said, the pros of the breathability from the thinness may outweigh the aesthetic or durability concerns for individual sleepers. The Tuft & Needle mattress has a medium to medium-firm feel, putting it around a 6-6.5 out of 10 on the firmness scale, where 10 is the most firm. Tuft & Needle’s main goal from the beginning was to create a mattress fit for “universal comfort.” This mattress would fit the needs of many different types of sleepers without having to adjust firmness levels, granting it a “one mattress fits all” approach. Flash-forward 2 years and Tuft & Needle has changed its mattress 4 times, all of which resulted in different firmness levels (gradually decreasing each iteration from very firm, to the current medium firm). The current iteration is a medium-firm feel, about a 6-6.5 out of 10 on the firmness scale. Upon initially lying on the mattress, there is a bit of pressure relief and sinkage followed by a strong push-back. Depending on your personal weight, sinkage may vary, but should fall in the range of 1-2”. To add to that, the sinkage simply sinks straight down, without much body contouring or hug. It’s not a latex foam or a memory foam; Tuft & Needle’s uses a proprietary poly foam. The feel / comfort of this foam is less-than-great, in my opinion, feeling quite dead. Sinkage and materials aside, my biggest issue here is not necessarily in what the company used for the comfort layers, but rather the limited amount used. 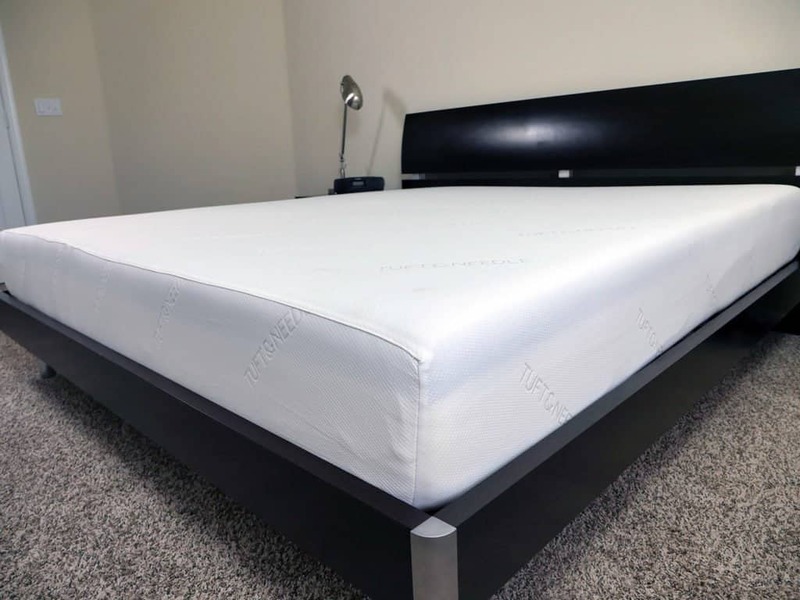 The Tuft & Needle only has 3” of comfort foam, which in my opinion just is not enough material between the sleeper and the hard support foam to create a significant comfort barrier. On my side and back, I experienced a lot of sinkage around my core (mainly the midsection), which resulted in some noticeable pressure points since my spine couldn’t quite get in its natural alignment. As for cooling, the Tuft & Needle mattress does fairly well. This is in large part due to the thin cover and top foam layer, a proprietary foam that I suspect is infused with graphite to help with cooling. Regardless of the performance of these materials in other categories, with respect to cooling, it performs very well. Note – the graphite infusion is not confirmed by Tuft and Needle. 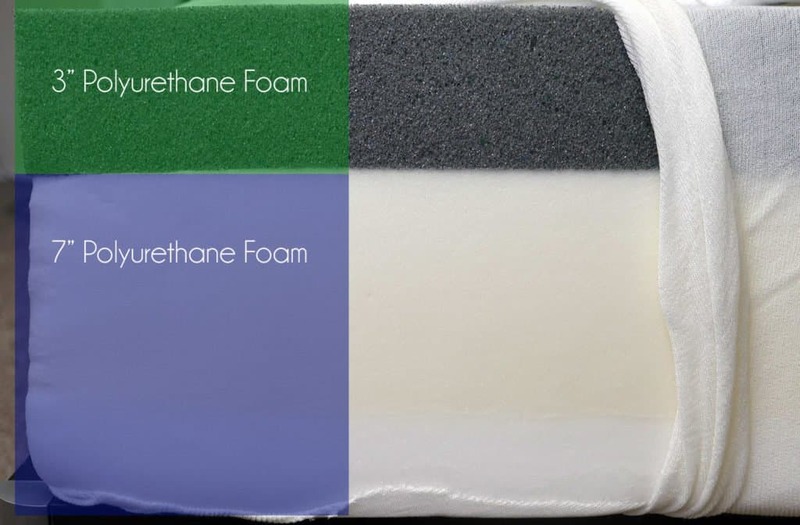 Tuft and Needle does not disclose the formula for their proprietary foam. In my experience with other foams it looks and feels like it has been infused with a large percentage of graphite. However, that is speculation. Overall, Tuft & Needle is a very average mattress. Tuft & Needle was once a unique offering, but many competitors are now creating better products at a similar or sometimes even lower price point. Despite Tuft and Needle’s changes to its mattress, the minimal use of comfort foam and the use of poly foam as the sole comfort layer leaves me wishing there was something a little extra. Should I buy the GhostBed or Tuft & Needle mattress? All things considered, the question remains: should you buy a GhostBed or Tuft & Needle mattress? 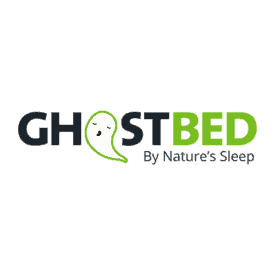 After both sleep tests and looking at all factors of their construction, durability, and overall comfort, the winner of this mattress battle is GhostBed. Overall, GhostBed edged out Tuft & Needle. The thicker profile, use of higher-density foams, use of memory and latex foam (vs. standard poly foam) for the comfort layers, and more durable cover are the main factors that helped seal this victory for GhostBed. Want a medium to slightly firmer feel – The GhostBed mattress starts at around a solid 7 after first lying down on the mattress, but as your body begins to sink into that memory foam layer, it becomes more like a 6.5 out of 10 on the firmness scale, with 10 being the most firm. 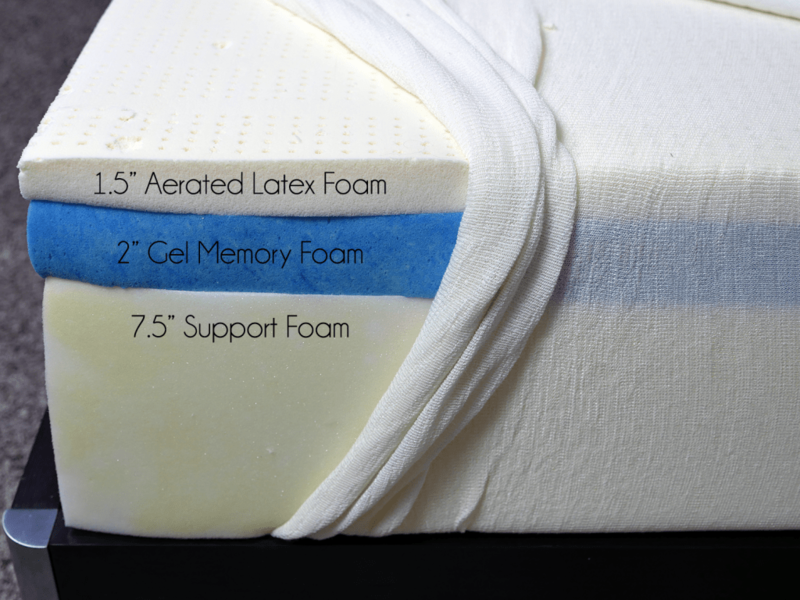 Want a combination of memory foam and latex – Who said you had to choose? 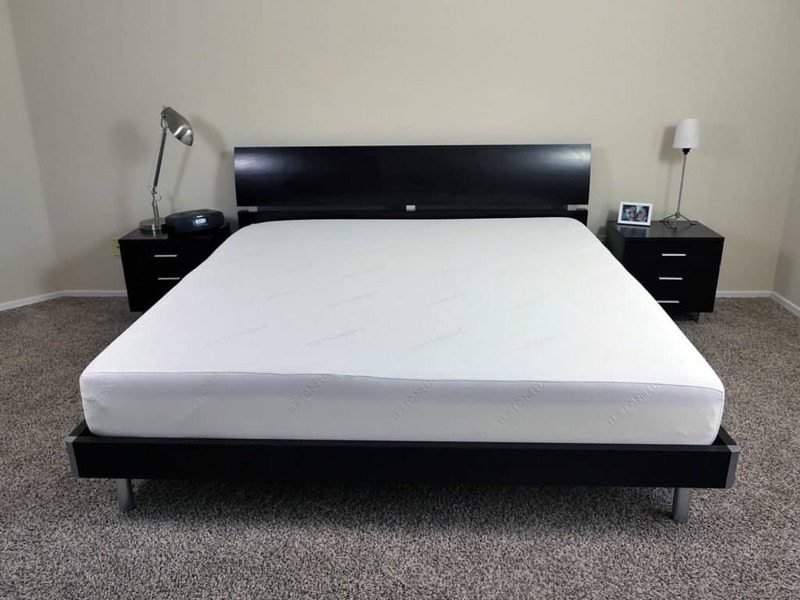 The GhostBed combines the initial bounce and instant response that people love about latex with the deep contouring and hug that is great about memory foam. Too much of either foam can have negative effects on some sleepers, but GhostBed toes the line between the two materials. Want great support – This mattress has great support, whether you’re in the middle of the mattress or even close to the edge. Simply put, no matter my position, my body was met with a comfortable and supportive foam layer beneath. Want a cool mattress – With the combination of 1.5” aerated latex and 2” gel memory foam beneath, this mattress sleeps extremely cool. 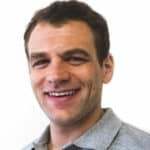 This is especially great news for sleepers who love the feel of memory foam, but don’t love the heat retention it typically brings. If you don’t think the Ghostbed is right for you, the Tuft and Needle can still be a good fit. Want a medium-firm feel – The Tuft & Needle mattress is around a 6-6.5 out of 10 on the firmness scale, with 10 being the firmest. 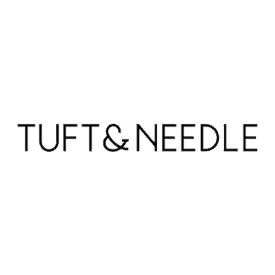 Have a tighter budget – Tuft and Needle uses simple materials and doesn’t have many added bonuses, but it does score a few points in the budget category. At only $750 for a Queen, this mattress is quite affordable so long as you keep in mind the quality of mattress that you get. Are less picky about the details – For sleepers who just “need a mattress” and may be less picky about the feel, Tuft & Needle may be an okay choice.